The women's ensemble In Mulieribus. Nancy Pole Wilhite, first president of the ensemble's board of directors, is most responsible for this unique feat. She visited the Getty Museum in Los Angeles in 2003 and was captivated by an exhibit, “Illuminating the Renaissance,” that featured Flemish manuscript paintings and small, hand-held devotional books. These books had hand-written prayers and vibrant illuminations, featuring flowers, animals or birds, even insects, along the margins. “Medievalists believed that small objects ideally embodied art and beauty,” Nancy recalls. She was particularly drawn to the Master of Mary of Burgundy Book of Hours, with its exquisite and ornate artwork and drawings. “As I moved from display case to display case I kept thinking of Mary of Burgundy using this book every day to pray with, and I could just hear women singing while at prayer,” she says. Nancy visited the Mount Angel Abbey library and its Books of Hour collection in 2009 with artistic director of In Mulieribus Anna Song and singer/art professor Ann Wetherell. They concluded that there was sufficient material to stage a concert featuring visual images from that collection. Song began researching vocal material from the medieval era. She and Wilhite developed the format: eight sections, each representing one of the hours. It begins with Matins at daybreak and ends with Compline, the evening prayer. 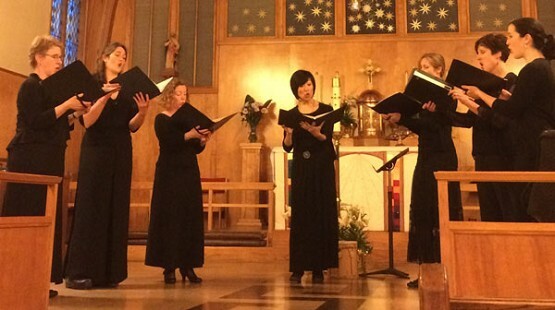 The concert focuses on the Hours of the Virgin, which highlights Mary's role in salvation history and honors eight events in her life. A visual component is timed to accompany specific music being sung. 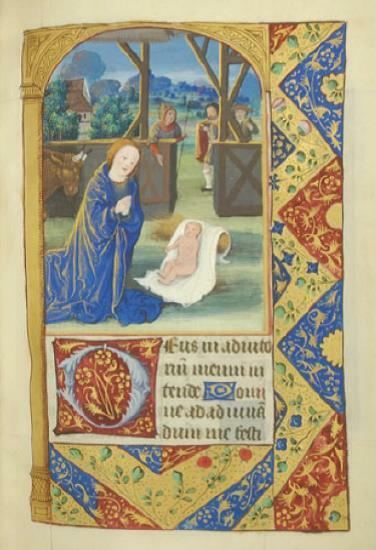 A large screen will project images highlighting aspects of the Mount Angel Books of Hours. “My role,” explains Sumi Wu, videographer, “is to visually tell the same story the music portrays.” She is particularly drawn to the vision of women holding these books in their hands, using them to pray with. At Matins, because it's before dawn, Wu incorporates the flicker of candlelight. At compline she plans on ending the video with a long peaceful, quiet image. Vespers is one hour where she uses a different emphasis. “I went for it,” she says, “and decided to use as many images of the flight to Egypt as I could, focusing on Mary holding her child.” Some of the images are more downtrodden, some more urgent. Some portray quiet sadness. None of this would have been possible without Mount Angel Abbey’s sizable collection of rare books and its generosity in allowing access to the digital images to In Mulieribus. Victoria Ertelt, library administrator, is excited about sharing the books’ beauty. “It's really amazing that we have this sizable a collection of rare books in this small little abbey in rural Oregon,” she says. The monks have a history of appreciation for older books. Some of the original monks brought books from their mother abbey Engelberg in Switzerland when they settled in Oregon in 1882. Then in the 1930s, one of the monks, Father Martin Pollard, who was studying in Rome, came upon a bookstore in Aachen, Germany, that specialized in theology, history, and the sciences that was closing and offering their collection at a very reduced price. The abbey chapter voted to pay for the books and they were mailed to the abbey. The abbey acquired 15,000 books shipped in 134 boxes for 3,300 Marks, or $785. The oldest book was printed in 1519, several were from the 1700s, most of them from the 18th or 19th centuries. These books were considered invaluable in replacing a library that had been lost in a devastating fire of 1926 that reduced the entire monastic and college buildings to ash. Concertgoers will be able to replicate the experience of the owners of these Books of Hours by entering a meditative and visual journey back to the Middle Ages. One could almost think the books are alive again. The author is the new president of In Mulieribus’ board of directors. Direction by the talented and insightful Kathleen Worley will only serve to enhance and deliver an already amazing evening. Thank you one and all. This comment has been hidden due to low approval.